Don't forget to wear your Red, White & Blue! $5 of every registration will go towards the 2017 Freedom Flight for our veterans. 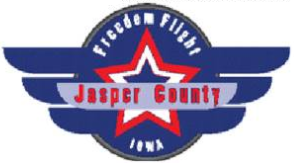 The Jasper Flight committee is in the process of assembling a trip for our veterans who have participated in the global war on terror. The hope is to have a trip take place in the Fall of 2017. When this page loaded, the official time was 4:25:19 PM EDT.